Even with the iPhone and iPad offering bigger screens—the 5.8-inch iPhone X and 12.9 iPad Pro, for example—sometimes you want a really big screen. Whether it's a great game, movies and TV bought from the iTunes Store, or photos you want to share with a group of people, sometimes even 12.9 inches just isn't enough​. In that case, if you've got all the required things, AirPlay Mirroring comes to the rescue. Apple's AirPlay technology has been a cool and useful component of the iOS and iTunes ecosystem for years. With it, you can stream music from your iOS device over Wi-Fi to any compatible device or speaker. Not only does this allow you to ​create your own wireless home audio system, it also means that your music isn't just confined to your iPhone or iPad. You can also go to a friend's house and play your music for them over their speakers (assuming the speakers were connected to Wi-Fi, that is). At first, AirPlay only supported audio streaming (in fact, because of that, it used to be called AirTunes). If you had a video you wanted to share, you were out of luck—until AirPlay Mirroring came along. 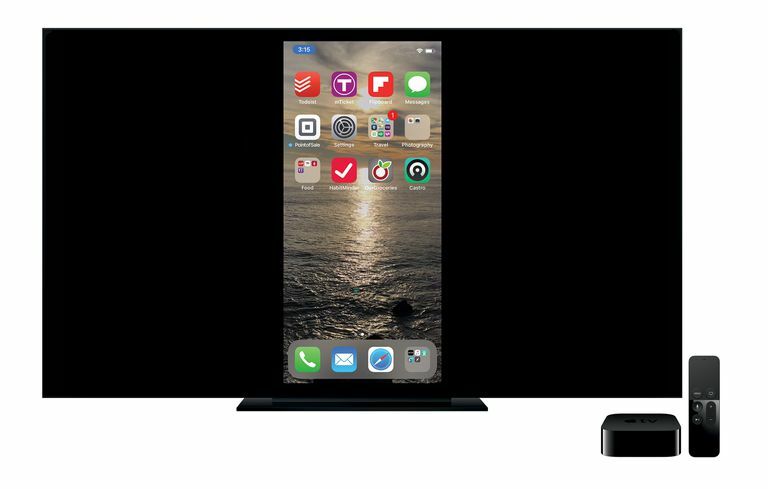 AirPlay Mirroring, which Apple introduced with iOS 5 and has been available on all iOS devices ever since expands AirPlay to allow you to display everything that's happening on your iPhone or iPad's screen on an HDTV (i.e., "mirror" it). This is more than just streaming content; AirPlay Mirroring allows you to project your screen, so you can share web browsing, photos, or even play a game on your device and have it show up on a huge HDTV screen. An Apple Digital AV or VGA Adapter. To use AirPlay Mirroring on Windows, you'll need some extra software. Find out more in Where to Get AirPlay for Windows. Begin by connecting your compatible device to the same Wi-Fi network as the Apple TV you want to use for mirroring. Once you're connected, swipe up to reveal Control Center (on the iPhone X, swipe down from the top right corner). On iOS 11, look for the Screen Mirroring button on the left. On iOS 10 and earlier, the AirPlay button is on the right-hand side of Control Center, around the middle of the panel. Tap the Secreen Mirroring button (or the AirPlay button on iOS 10 and earlier). In the list of devices that appears, tap Apple TV. On iOS 10 and up, you're done. In iOS 7-9, move the ​Mirroring slider to green. Tap Done (not required in iOS 10 and up). Your device is now connected to the Apple TV and mirroring will begin (sometimes there's a short delay before mirroring starts up). You may encounter short delays between what's happening on your device's screen and when it appears on the HDTV. These delays may be noticeable, but they shouldn't be substantial. If the delays are significant, there may be interference with the Wi-Fi signal or your Wi-Fi network may not be fast enough. In this case, make sure no other devices are trying to connect to the Apple TV, reduce or end ​other devices use of the Wi-Fi network, and ensure that Bluetooth is turned off on the device you're mirroring. Depending on your TV and the content you're mirroring, the image you mirror may not fill the entire screen and instead shows a square image with black bars on either side (as in the image at the top of this article). This is due to a difference between the iPhone/iPad screen resolutions, and the resolution of the content they show, and the TV. To end AirPlay Mirroring, either disconnect the device you were mirroring from Wi-Fi or follow the steps you used to turn mirroring on and then tap ​Stop Mirroring, or Done, depending on what your version of the iOS displays.